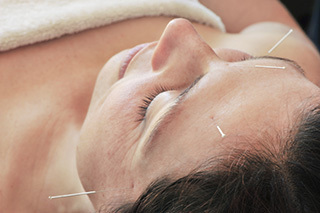 (HealthDay News) — For women with breast cancer receiving aromatase inhibitors (AIs), real acupuncture (RA) and sham acupuncture (SA) seem to improve patient-reported outcomes, according to a study published online Dec. 23 in Cancer. Ting Bao, M.D., from the University of Maryland Greenebaum Cancer Center in Baltimore, and colleagues randomized postmenopausal women with stage 0 through III breast cancer who received an AI and had treatment-associated musculoskeletal symptoms to receive eight weekly RA (23 patients) or SA (24 patients) sessions. The researchers identified significantly improved scores from baseline to week eight in the RA arm for the Center for Epidemiological Studies Depression scale (P = 0.022); hot flash severity and frequency (P = 0.006 and 0.011, respectively); the Hot Flash-Related Daily Interference Scale (HFRDI; P = 0.014); and National Surgical Adjuvant Breast and Bowel Project (NSABP) menopausal symptoms (P = 0.022). In the SA arm, significant improvements from baseline were seen for the European quality-of-life survey (P = 0.022), the HFRDI (P = 0.043), and NSABP menopausal symptoms (P = 0.005). Compared with the 38 non-African-American patients, the nine African-American patients benefited more from RA than SA in reduction of hot flash severity and frequency scores (P < 0.01 for both). “Both RA and SA were associated with improvement in patient-reported outcomes among patients with breast cancer who were receiving AIs, and no significant difference was detected between arms,” the authors conclude.